1. Mountain Brook is designated as a tree city by the Arbor Day Foundation. That means we have a lot of healthy trees. 2. There are over 300 species of trees in Alabama. 3. Canopy trees—oaks, elms, and pines are good because they offer shade (they make our landscape more beautiful too). 4. Becoming a Certified Arborist means you have taken and passed one or more of the tests administered by the International Society of Arboriculture (ISA). A minimum number of continuing education units are required to maintain certification. 5. The road to becoming an Arborist in Mountain Brook is to first get a Forestry degree from Auburn and then get lucky and meet City Manager Sam Gaston. 6. A quick tip to help your trees: Water; high volume, low pressure (think drip). And start when the growing season starts. Drought stress can be prevented, but not reversed. 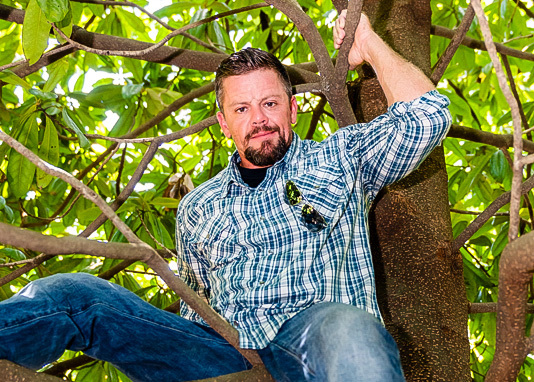 The road to becoming an Arborist in Mountain Brook is to first get a Forestry degree from Auburn and then get lucky and meet City Manager Sam Gaston. 7. Favorite tree in Mountain Brook: large ginkgo near Crestline. 8. A day in the life of an Arborist involves checking on the health of a magnolia tree, hauling bales of hay and speaking to a garden club. the extent that it can make doing that much easier or much harder. 10. Contractors by law have to haul their refuse away; that doesn’t mean they always do.